Hopefully you are aware that hasty generalisations make lazy and fallacious arguments. It doesn't matter what case is being argued, if it relies on an unsubstantiated generalisation it is invalidated. 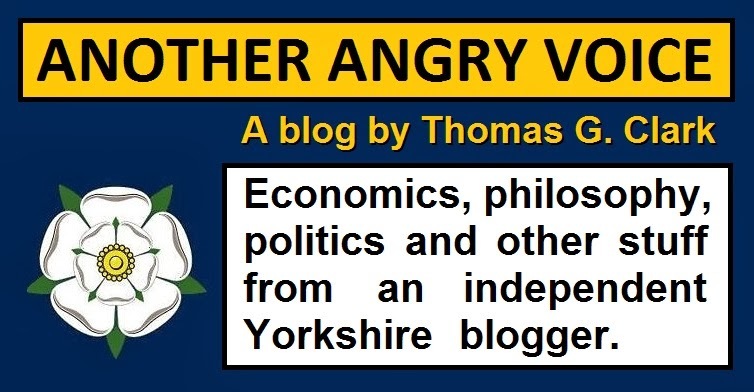 Generalisations are rife in the tribalistic political mentality, "the left" are often as bad as "the right" at positing arguments that rely on lazy generalisations and subsist of little more than empty political rhetoric. As this is a blog about right-wing fallacies, I'll stick to providing right-wing examples. Here are a just few. Trade Unions are "in it for themselves"
People that oppose attacks on basic labour rights "oppose hard work"
The disabled and unemployed are "scroungers"
Public sector workers are "lefties"
These are all lazy generalisations but the subject of this article is one of the most astonishingly poor generalisations I have ever come across. It was written by a guy called Gary Hull who is affiliated with the barkingly right-wing Ayn Rand Institute. It was published in an essay he wrote for Capitalism Magazine. It is such an appallingly poor argument I had to check that he hadn't been misquoted before I decided to write this critique. This is what he said. "Egalitarianism, which claims only to want an 'equality' in end results, hates the exceptional man who, through his own mental effort, achieves that which others cannot." The remarkable thing about this statement is that it ascribes an emotion to an abstract concept. If he had stated that Egalitarianists hate the exceptional man, then we could dismiss it as yet another lazy generalisation from the political right, but what he states is that the abstract concept of egalitarianism has capacity for hatred, which is so absurd it is an almost psychedelic argument. An argument which exists in a philosophical fantasy world where liberalism can trust, fascism can swim, abstinence can fear, tiredness can lust, hope can shout, honesty can laugh, the number seventy eight can dream, vaccination can dance and colourless green ideas can sleep furiously. This claim that a concept has emotional capacity is so absurd it is surreal. It is an abuse of reason, logic and linguistics rolled into one appallingly vapid piece of rhetoric. Even if we skip past this philosophical incoherence and analyse the claim, this too is gibberish. There are many fields of egalitarian thought, one of which is gender egalitarianism. How on Earth does the egalitarian idea of "equal pay for equal work" hate the exceptional individual? The concept of equal pay for women (for the same amount of work) actually promotes the exceptional woman by ensuring she receives the same economic reward for her labour as the exceptional man. 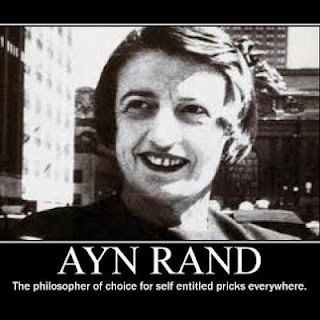 It is no surprise at all to see such a philosophically invalid and easily demolished statement coming out of the Ayn Rand institute, after all Ayn Rand is the undisputed queen of vapid pseudo-philosophy. Ayn Rand's barmy greed-is-a-virtue mantra is inexplicably popular with the American public, her magnum opus "Atlas Shrugged" has persisted as an American best-seller for decades despite its appalling pseudo-philosophical agenda and its glaringly unrealistic hero characters. The Nobel Prize winning economist Paul Krugman famously quipped "There are two novels that can change a bookish fourteen-year old's life: The Lord of the Rings and Atlas Shrugged. One is a childish fantasy that often engenders a lifelong obsession with its unbelievable heroes, leading to an emotionally stunted, socially crippled adulthood, unable to deal with the real world. The other, of course, involves orcs." The scariest thing about Ayn Rand's barmy pseudo-philosophical ideas is that her "objectivist" acolytes have assumed hugely powerful roles in the World economy. Alan Greenspan, the former chairman of the US Federal Reserve who led the global financial sector into a near total economic meltdown was an Ayn Rand groupie. One of the leading voices of neoliberal pseudo-economics (who died shortly before he could witness the neoliberal economic meltdown he helped to create with his deregulation mantra) Milton Friedman stated that Rand was "a person that did a great deal of good". The Republican candidate for Vice President in the 2012 elections Paul Ryan is another Rand fanatic who cites her as an inspiration and has spoken at another Rand cult called the Atlas Society. The fact that so many highly influential politicians and economists have bought into Rand's fetishisation of elitism and self-interest is extremely concerning. Not just because of her fascist ideology of Übermenschen but because of the appalling lack of critical judgement that allows her devotees to spout such philosophical incoherence, without attracting criticism from their peers. The popularity of Rand's incoherent pseudo-philosophy of Übermenschen and the glorification of pure self-interest was actually predicted by the 19th Century French economist Frederic Bastiat when he stated that "When plunder becomes a way of life for a group of men living together in society, they create for themselves in the course of time a legal system that authorizes it and a moral code that glorifies it”. The success of Rand's appalling pseudo-philosophy can be explained because it allows the powerful, greedy and self-interested to believe that their avarice is not actually a sin (as most ethical systems claim) but actually the highest virtue, with all other "virtues" being aberrations. Upon discovering a worldview that allows them to glorify their insatiable greed as a virtue, the sociopathically self-interested individual is likely to suspend critical analysis and simply embrace the idea because they so want it to be true. 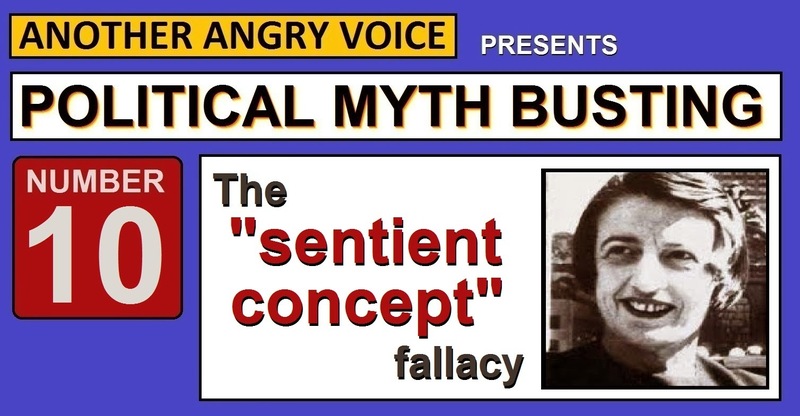 The fact that proponents of Rand's ideology of "objectivism" are prepared to publish stunningly incoherent statements of semantic nonsense that ascribe sentience to abstract general concepts such as "egalitarianism" in order to underpin lazy and easily falsifiable generalisations is a clear demonstration that these people are deluding themselves with vapid pseudo-philosophy in order to justify their own greed. It is of grave concern that one of these loonies may well be occupying the office of Vice President of the most powerful economy in the World in just a few months time.